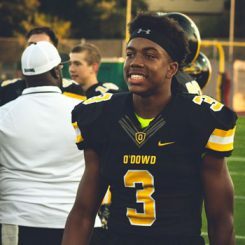 In addressing the 2018 Oregon Ducks Football recruiting class, one of the staff’s main goals was to shore up the back end of their defense. 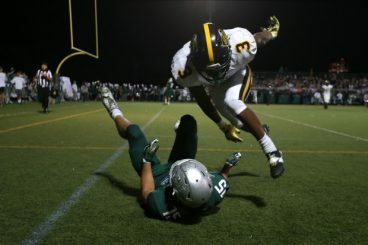 And one of the top targets in the west was Jevon Holland from Bishop O’Dowd High School in Oakland, California. 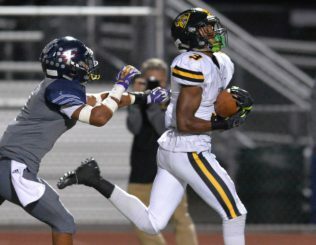 Oregon secured a commitment from him on May 1, 2017, and he stuck all the way through to National Signing Day. Holland was rated the No. 30 defensive back in the nation by 247.com. Scout.com listed him as the 7th best “Athlete” and the No. 131 overall player in the country. He was also named to the Tacoma News-Tribune Western 100, a prestigious compilation of the best high school players in the western United States every year. Jevon compiled some impressive performance statistics on both sides of the ball. In three varsity seasons he accounted for 119 tackles, 18 pass-break ups, and 13 interceptions. 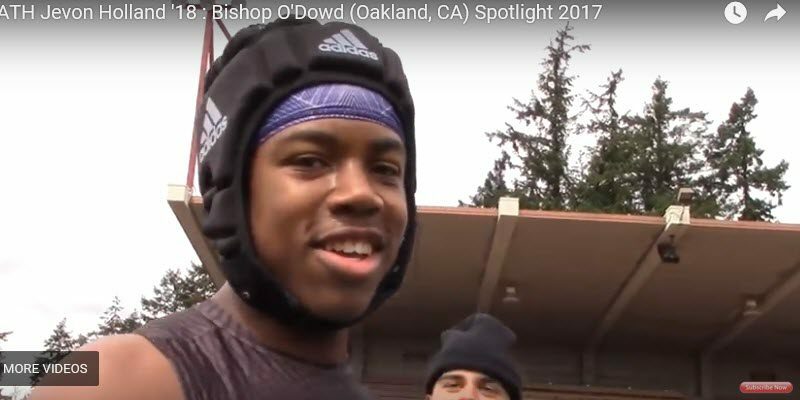 But he didn’t just sit on the bench when Bishop O’Dowd had the ball; He racked up over 2,800 all-purpose yards and 20 touchdowns as a receiver, running back, punt returner, and kickoff returner. Holland has been reported between 6-foot-1 and 6-foot-2. He’s also been reported at 180-185 lbs. The recruiting website 247.com lists him at 6-foot-1 and 182 lbs., while ESPN.com lists him at 6-foot-1 and 180 lbs. Meanwhile, Maxpreps.com lists him at 6-foot-2 and 185 lbs. At The 2017 Opening Regionals in Oakland, California, Jevon was measured at 6-foot-1 and he weighed in at 180 lbs. I haven’t seen any information on him as to arm length or hand size. However, for similar sized athletes an arm length of 31″ to 32″ and a hand size of 9-1/4″ to 9-1/2″ is about right. Jevon Holland is a very good (not great) athlete. At The Opening Regionals he recorded a 4.70 40-clock, a 4.34 20-yard shuttle, a 37’0 power ball, and 37″ (36.9″) vertical jump. Though these marks are all very good; none of them are elite. His total SPARQ score of 98.22 however, is close to what we consider a great athlete (100). A range in the 110 to 130 is recognized as an elite athlete and anything over 130 is “Freak” status and quite rare. Holland is a well built athlete with the frame to carry 200 lbs. without impacting his athleticism. His range and ability to locate and track the ball is ideally suited for the back end of the defense. He has demonstrated the ability to open up his hips, pivot, and run well enough that he could play some press corner. But his natural position is free safety, where a lack of a top end gear and elite athleticism would not be an absolute requirement, unlike your preferred boundary corner. In the video above, Holland comes downhill to stop the ball carrier for a short gain. In the video above, Holland uses his 36″ vertical to come over the top and break up a pass in the corner of the end zone. Throughout his tape, Jevon demonstrates the ability to track the ball in space. In the video above he locates and tracks the football, and finishes by making the interception in the deep third of the field. Holland flashes textbook press coverage in the video above. At the snap he delivers a hand punch to disrupt the timing between the quarterback and the receiver. He then opens his hips and turns to mirror the receiver down the sideline. He crowds the WR, utilizing the sideline as another defender with the intent to run the receiver out of bounds. With his head turned and playing ball, this is great defense. Jevon runs a nice Stop and Go route up the sideline for a TD. He times his burst to coincide with the cornerback “biting” on what he thought was a curl route inside. This is a down-and-distance situation where Holland is up tight in press coverage anticipating “low branches” (quick breaking routes) on the wide receiver route tree. The WR falls down and Holland jumps into the vacated slant route for the pick. Above, Jevon adjusts to a ball thrown behind him that is tipped by a defender. Rather than give up, he makes a play on the ball for a big gain. Here, Holland demonstrates the ability to sink, mirror, change direction, and come over the top for the pass breakup. In the above clip, Jevon flashes his creativity in the open field on a punt return. He demonstrated this trait throughout his high school career. Rashaan Gaulden of the Carolina Panthers. 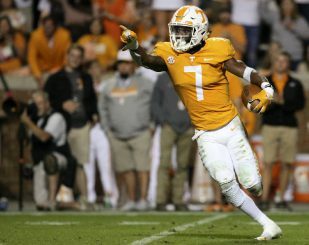 Gaulden played collegiately at the University of Tennessee and was taken in the third round (No. 85 overall) of the 2018 NFL Draft. Holland shares similar size and athleticism to Gaulden, as well as football pedigree. It is reasonable to assume that his career will track along this same trajectory both collegiately and at the NFL level. Other athletes with similar triangle numbers and athletic trajectory are Treston DeCoud, who was a 2017 fifth round selection (No. 169 overall) of the Houston Texans. Chuck Clark out of Virginia Tech, who was the Baltimore Ravens’ sixth round pick in 2017 (No. 186 overall), is another good comparison. Former 4-Star defensive back and USC alum Leon McQuay III also has a similar profile to Holland. McQuay was taken in the sixth round (No. 218 overall) of the 2017 draft. Jevon Holland has the frame at 6-foot-1 to carry more good weight and play in the 200 pound range when fully matured physically. This is good (not great) size for a safety. He demonstrates a smooth back pedal and opens his hips to turn and run without any hitch. He can sink, mirror, and change direction while maintaining contact with a receiver. He appears to diagnose the run or pass quickly and takes proper angles to the ball. He is a willing and aggressive tackler in run support. He has special teams ability on punt and kickoff return teams, and flashes confidence and creativity in his return game. However, there are legitimate concerns about his foot speed. As discussed above, he ran a 4.70 40-clock at The Opening Regionals prior to his senior year of high school. As a general rule, all of these kids improve their overall athleticism (SPARQ scores) as they mature, and that obviously includes speed. Nevertheless, to get down into the range a free safety should be running (sub-4.55 at a minimum) would represent a significant improvement. In the 2018 NFL Draft, there were 86 safeties available and only 18 were drafted. At the top of the draft (rounds 1-3), nine were picked and six of those were free safeties. In rounds 4-7, the inverse occurred: 6 of the 9 picked were strong safeties (in other words: less athletic back-end guys). It’s a given that the two positions have different responsibilities and thus require a different type of athlete. The point of this exercise is to show that Holland lacks the top end gear and athleticism to patrol a lot of green grass behind him. And he lacks the imposing physical size to play down in the box like a Derwin James, Ronnie Harrison, or Kyzir White. All of these guys are in the 6-foot-2 and 210-215 lb. range. What does this have to do with college football in general, and the Oregon Ducks in particular? Well, if you’re not recruiting top tier talent with the physical profile that projects well on Sundays, then you’re not really competing with the preeminent powers of college football. 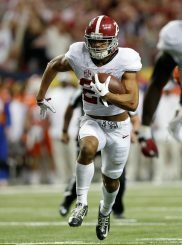 For example: Minkah Fitzpatrick was not only the highest rated safety in last year’s draft, he was the also the first one taken. His high school recruiting test results from ESPN.com illustrate what a premier safety looks like athletically, with a 115+ SPARQ score highlighted by an elite shuttle of less than 4 seconds (3.87). And where did he play football in college? Alabama, of course. Jevon Holland should have a solid career at Oregon, but his ceiling is not particularly high because he lacks the elite athleticism that you want to see at the back end of the defense, and lacks the size to play consistently in the box. I believe it is a very real possibility that kids yet to be signed by the Ducks could come in and push him down the depth chart.